Introduce a soft splash of color and elegant style with this distressed blue rectangular wall mirror. Rest on the classic style and cool design aesthetic of this fabulous mirror from Cooper Classics. Gradient levels on its distressed blue wash finish frame add a sophisticated attitude and enhanced color. This distressed blue rectangular wall mirror ties together elements of a subtly colored traditional or contemporary room design. 28" wide x 40" high x 2 1/2" deep. Hang weight is 32 lbs. Glass only section is 18 1/2" wide x 30 3/4" high. 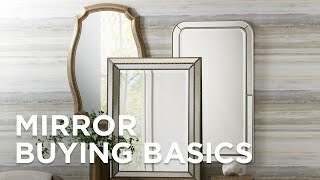 Rectangular wall mirror from the Cooper Classics Troy Mirror collection. Distressed blue wash finish. MDF wood frame construction. Unconventional shape adds intrigue to accent decorand this octagonal hanging wall mirror yields a perfect example. Equally stylish when arranged together or alonethis 4-piece wall art set includes four matching frameless designs. An updated play on Atlas holding up the worldthis transitional round wall mirror features an intriguing figure at its base. This hexagon wall mirror is crafted from pecan finished wood featuring a highly textured rustic look to add ambiance to a room.